where she learned how to work with clay, stone and marble, and to make jewellery. Later on in Paris, she studied traditional jewellery-making and the art of mime. and send its photo to Him. and if she would make another one, four to five feet tall, for the new "OSHO-Auditorium". 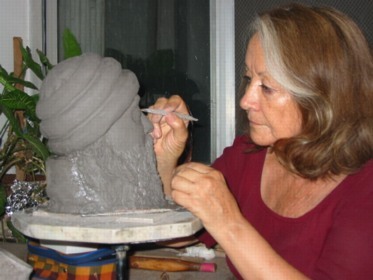 She has dedicated her whole life sculpting and painting OSHO. "All art is about melting in Love with the object one is creating. To melt with OSHO and express His Spirit in my art, is a deep fulfillment for me".